This article is the second of a three-part series, featuring an exclusive interview with Victor V. Shalaj and Valery I. Trushlyakov, reporting their research on space safety and sustainability. Read Part 1 here. 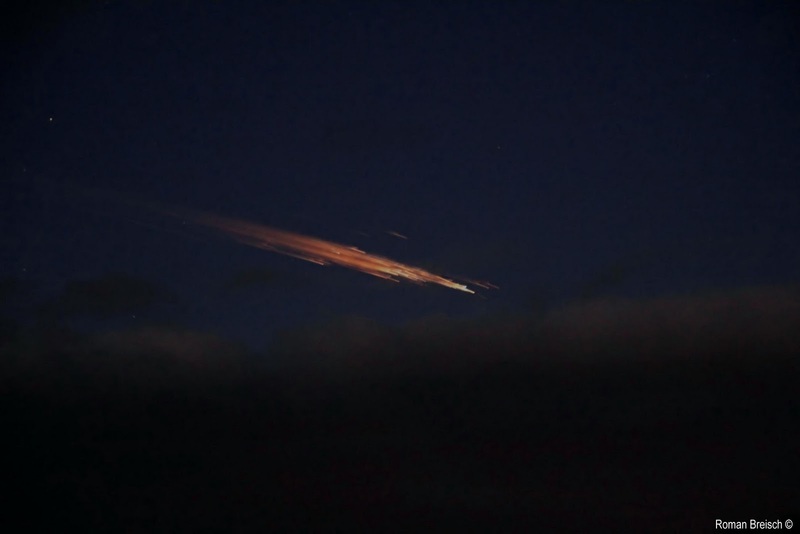 Soyuz rocket debris re-entry in the atmosphere over Germany (Credits: Roman Breisch). After working in rocket design for 23 years, one may think it could be difficult to re-invent the profession, but that wasn’t true for Professor Valery Trushlyakov. Trushlyakov contributed to the design of Cosmos 3M, one of the most reliable launchers ever built but also nowadays one of the major contributors to low Earth orbit debris, having left many rocket bodies orbiting uncontrolled. Trushlyakov is now leading a project with the aim to avoid creating new debris from launchers’ upper stage but also to clean the existing space debris. The gasification system, developed by Trushlyakov and Victor Shalaj for reducing the harm from toxic fuel in Proton’s first stage was the starting point for a new system concept, able not only to make a rocket clean in flight, but also to direct it to a specific landing location. In fact, retrieving rocket body parts that have fallen to Earth is still an issue, especially if you consider the geography of the Russian dropping zone, with mountains, lakes, immense taiga, frozen for the greater part of the year. Trushlyakov explained that they soon realized that the technology used to reduce toxic waste for the rocket’s fuel, could also be used to direct its landing. Every rocket has a certain percentage of propellant not used after the separation of the stage as margin. This unused propellant in the end represents a loss in the total payload capacity. The system that Trushlyakov and his team studied, in cooperation with Politecnico di Milano, is an Autonomous Onboard De-orbiting System or ADOS. The goal of ADOS is to take this propellant margin and make it useful. The ADOS system inside the upper stage of a rocket (Credits: V.I. Trushlyakov). The liquid propellant in the tank, once gasified (link to the previous article), is used to feed a Gas Rocket Engine (GRE). The GRE was built in the ’60s by Valentin Petrovich Glushko, principal soviet designer of rocket engine, but it was never used. This approach both reduces the harm from pollutant products and redirects the rocket to a safe and more accessible drop point. For upper stages this system can also be used to give additional burns to de-orbit the stage after the payload’s deployment with few maneuvers. ADOS can basically be used for every liquid stage, increasing safety and decreasing, at least theoretically, the impact of future launches on low Earth orbit. This is not a totally new concept. The Americans, Japanese, and French have explored use of residual fuel for controlled re-entry of the 2nd stages of the Delta IV, HII-B, and Ariane 5 respectively. However, since these rockets use, liquid hydrogen-oxygen (LOX/LH2) as fuel/oxidizer, it is less problematic to re-start the main liquid propulsion engine. Russian space launchers use instead either high boiling toxic fuel such as UDMH (Proton-M, Rokot) or kerosene (Angara, Zenit, Soyuz). Ensuring the restartability of the main engine with such fuels is more problematic and this is why Trushlyakov started developing the ADOS concept in the first place. Although so far the initiative has been Russian in origin, Trushlyakov emphasizes the need for an international effort from every country involved in space. He and his team are ready to work with international teams to develop similar system for other launchers, whenever they demonstrate interest. ADOS addresses the need to keep near-Earth space free of new debris. But since Earth orbit has been already polluted with tons of debris since 1957, mitigation might not be the only approach to address the space debris issue. In the third and final installment in this series, we will learn of the steps Trushlyakov is taking to meet this looming hazard and Shalaj’s prognosis for the Russian Space industry.